from painting The Blinding of Samson. "Come in," he would say, "I was just painting myself, "
What a wonderful painting. He's so dark against that soft light. I've not seen this one before, thank you for this charming post Willow! The tonal values in his work are masterful. Hi Willow, is it my imagination or is that a new background colour you have? I like it. I am only very slightly familiar with the works of Goya; but this painting and post are intriguing; I'll have to 'google' him and see what comes up. I just saw your quote at the end of your blog. I love You've Got Mail! I would visit 'the shop around the conner' every day (except I would also need coffee). I would wonder through the store, pick up books, flip through them, barrow one, and then sit and read some of it by the window while simultaneously listening to the store workers daily conversations. LL...yes! New background color...I love it...what do you think? Similar to the color of the bedroom walls. Softer than the grey! 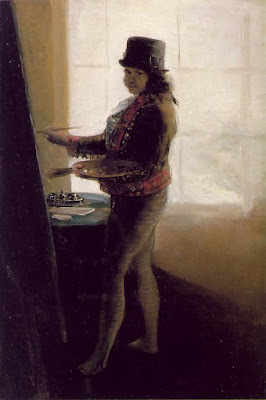 That's one amazing hat....I am familiar with some of Goya's work, but this is the first time I've seen his self portrait and his ingenious candle hat! You've Got Mail- "I wanted it to be you, I wanted it to be you so badly." Oh Willow, coming across the Peter Sellers picture like that made me laugh out loud! A wonderful touch. I am so impressed with your postings concerning art form. You truly have a knowledge and love for art. Thanks for sharing this new-to-me painter. Have a great week! I could have sworn you were English from your self-description. Who mentions Mrs. Dalloway here in the US? ...Apparently, you do. Found you in a search for "Goya self-portraits."